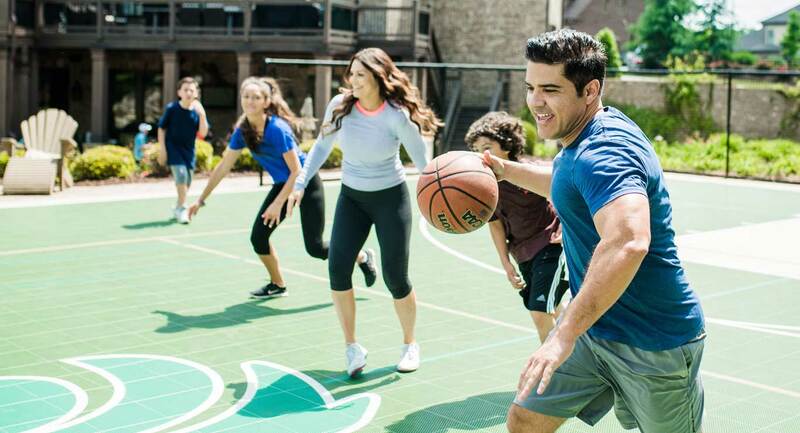 Installing a game court in your backyard can be the best investment you've ever made. Like any big investment, it deserves time and thoughtful consideration. We're here to help you plan and prepare. Here are 10 things to think about as you prepare to build your backyard court. 1. Sports - What Sports Do You Want to Play? To a large extent, what you play will determine the size of court you need. As many as 15 games can be played on a standard mid-sized multipurpose game court. Shifting from one to another is typically very easy and fast. If basketball is your family’s primary sport, a 3 point line may be important. At 19 ½ feet from the rim, a full 3-point line requires a court at least 25x45 feet to allow a player to shoot from behind the line. A court size of 30x60 feet allows for full court volleyball. The basketball hoop is often placed in the middle of the 60 foot side and used as the volleyball net post. This configuration allows for half court basketball with full court volleyball and other net sports on the same court. Do you play sports as well? 2. Space - How Much Space Is Available for Building a Court? 3. Permits - Do You Need a Permit to Build? 4. Contractor - What Contractor Should I Use? 5. Access - How Will the CourtBuilder Access My Backyard? 6. Sub Base - How Will the CourtBuilder Prepare the Sub Base? 7. Base - What Will CourtBuilders Use for a Base? The base is the hard flat surface where your court will be built. 8. Athletic Surface - Why Is a Modular Surface Better? Concrete or asphalt can be painted to look nice, but the surface doesn't provide any cushioning. Many people apply acrylics to these surfaces, but they offer only a very small layer of protection. Modular surfaces, on the other hand, are designed and engineered to absorb shock and allow water to safely pass through them and flow off the court. They keep athletes safer and ease wear on your body. 9. Manufacturer - Who Manufactures My Court? What is their distribution strategy? Who sells, installs and repairs? 10. Warranty - What Are the Different Warranties for Different Surfaces? Things can go wrong with any surface. Be sure to read the fine print on any warranty to ensure yourself a long, happy relationship with your new court.